Frankenstein tells the story of committed science student Victor Frankenstein. 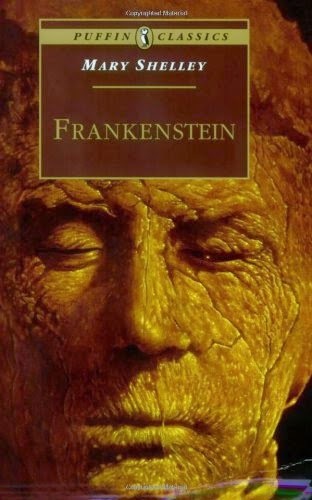 Obsessed with discovering the cause of generation and life and bestowing animation upon lifeless matter, Frankenstein assembles a human being from stolen body parts but; upon bringing it to life, he recoils in horror at the creature's hideousness. Tormented by isolation and loneliness, the once-innocent creature turns to evil and unleashes a campaign of murderous revenge against his creator. Classic horrors have never really been my thing. Having now read Frankenstein for the first time (!) I think more classic horrors will be in the pipeline for me. I wasn't expecting this work to be so beautiful, so breathtaking, and so totally contrasting to my previous perceptions and assumptions surrounding the story. Hollywood has a lot to answer for. As soon as Frankenstein brings his monster to life, he is immediately repulsed at the sight of him, and by what he's done. The monster is orphaned, and left to make sense of the world on his own. He seeks love and friendship, but finds only hatred. Every single human who comes across the monster rejects him, and his own creator was too disgusted to look at him, Shelley made it so easy to understand his woes, his frustrations, and most of all, his need for companionship. The monster must be one of the greatest literary outcasts ever written - I believe every misunderstood character since will have something in common with him. Shelley's writing is incredibly impressive when we consider the character of Frankenstein. At the beginning of the novel, he is easy to respect. He has huge dreams of unlocking the secrets of science, and it seems no one will stand in his way to do so. After the birth of the monster, he becomes an abhorrent character; we see him slowly lose both his mind and his humanity as he comes to terms with the consequences of his actions. His lack of compassion is disgusting, and although I should have hated him, Shelley wouldn't let me. Her writing totally conveyed his position, his reasons for his behaviour, and his deep regrets. So although Frankenstein is the true monster, we are led to sympathise with his plight as he becomes more isolated, and more akin to his creation. Let's debunk some Hollywood myths. Firstly, the monster teaches himself to read, write, and speak. And not in a fragmented, learning a foreign language way. He is potentially the most articulate character in the novel, and most definitely more eloquent than you or I. Hollywood either shows him as entirely mute, or only capable of a series of grunts. This lack of human communication will straight away convey the sense of the monster being a different species, and our trust in him will sink. Shelley, however, portrays him as entirely human, except in appearance. We sympathise with him, he can express his feelings and thoughts, and in doing so allows us to understand that his rejection is what leads to his murderous capabilities. Without launching into a nature vs. nurture debate, I'm sure things could've ended up just lovely if the monster had been loved by his creator. Myth two! There is no strike of lightning which brings the monster to life. It wasn't even a dark and stormy night. Electricity is not the secret to bringing sewn together limbs into being. Shelley, very tastefully, never reveals the key to life Frankenstein discovered. This made the whole thing so much more majestic, as readers would have scoffed at anything else. The film version gives us the whole thunder, lightning, evil laugh, and scary music. I know what I'd prefer. Thirdly - he's not green, he doesn't have bolts in his neck, and he doesn't live in a big castle. I'm amazed at just how much a story (not just a story - a masterpiece) can be distorted by media. This isn't a horror that will terrify you, or have you up all night expecting an amalgamation of human limbs to knock on your window. The horror here is the danger of playing God, the human instinct to judge upon sight, and most of all, the horror of being alone. I cannot recommend this novel enough, it's so beautifully human, provocative and a true treasure.